Dentures work as replacements for missing teeth and the surrounding gum tissue. These removable dental appliances are designed to resemble your teeth as closely as possible, oftentimes even enhancing your smile. With the increasing success and popularity of implant-retained complete and partial dentures, they have never been as comfortable as they are now! Getting dentures is a process that takes several appointments spread out over many weeks. Highly-accurate molds and measurements are necessary to create a well-fitting, custom denture. It might take several appointments to ensure that the dentures are the correct color, shape and fit. Dr. Cancelliere will adjust and place the completed denture at your final visit, giving you a comfortable, natural-looking fit. Proper care of your dentures, along with regular visits to Dr. Cancelliere, are necessary to extend the life of your dentures, and you will be given instructions on how to best care for your new dental appliance. 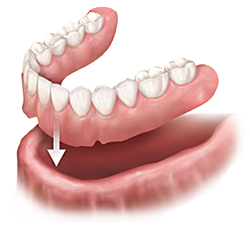 A removable partial denture replaces multiple missing teeth in either the upper or lower jaw. This replacement of missing teeth is necessary in order to restore your mouth to its original functioning condition and maintain normal facial contour. If a condition of missing teeth is left untreated, the remaining teeth may drift. Drifting teeth can lead to a bad occlusion (bite), additional decay and possible gum and bone problems. Each partial denture is precisely made to fit an individual’s unique situation. It is designed to be removable. 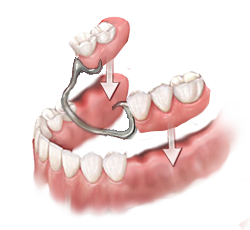 The partial denture is held with clasps that are comfortably fit around a select few of your remaining teeth . A partial denture is cosmetically designed to hide all metal whenever possible. The artificial teeth and guns are colored to match an individual’s natural teeth and gums. This type of denture can be used when a person doesn’t have any teeth in the jaw, but has enough bone in the jaw to support implants. 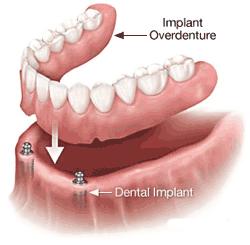 Your implant-supported denture will be more stable than a regular denture. You will find it easier to speak and you won’t have to worry about the denture becoming loose or falling out of your mouth. You generally will be able to eat foods you could not eat before. Usually, a regular denture made to fit an upper jaw is quite stable on its own and doesn’t need the extra support offered by implants. However, you can receive an implant- retained denture in either the upper or lower jaw. If you have an implant-supported denture in your upper jaw, it will feel more natural than a regular denture because the denture will no longer cover the roof of your mouth. As a popular alternative to denture, dental bridges provide a longer-term and healthier solution for tooth replacement. Instead of having to reshape the adjacent healthy teeth, one or more dental implants are positioned into the gums to function like tooth roots.